There are 40 million women seeking mammography breast-screening every year in the USA, out of which 15 million are women with heterogeneously dense or extremely dense breasts. USA epidemiology statistics show that 6 out of 7 missed cancers at mammography occur in women with dense breasts. It is also known that the majority of women presenting with mammography-dense breasts are below 45 years old. The Oct. 22 issue of the American Journal of Roentgenology ( AJR) publishes results of a study showing that ultrasound is superior to mammography in evaluating symptomatic women 30-39 years of age . This study was conducted by researchers at the Seattle Cancer Alliance and University of Washington. Patients were recruited between January 2002 and August 2006. 954 women ranging from 30 to 39 years old who presented for diagnostic breast imaging evaluation were examined, and it was found that sensitivity (probability for cancer detection) of ultrasound was 95.7 percent compared to 60.9 percent for mammography. A very important result of this study is the calculated Negative Predictive Value (the probability to have negative pathology if the imaging-test is negative) which was similar for both modalities: 99.9% for ultrasound and 99.2% for mammography. 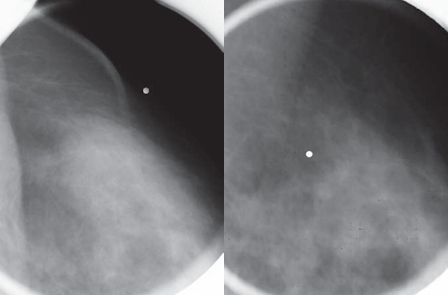 35-year-old woman who presented with a palpable left breast lump. 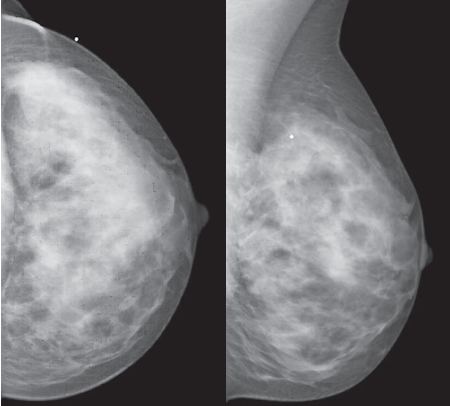 Whole-breast craniocaudal (above left) and mediolateral oblique (above right) and spot-magnification craniocaudal (below left) and mediolateral (below right) mammographic images show no abnormality at area of clinical concern, marked by BB. 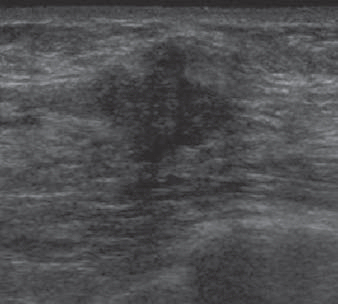 Targeted ultrasound image above reveals solid mass with irregular shape and indistinct and angular margins. BI-RADS 5 assessment was made. Histopathology from ultrasound-guided core needle biopsy showed invasive ductal carcinoma. When reading this article I noted a gap to overcome if we want to successfully replace mammography with ultrasound. The Positive Predictive Value (the probability of detecting a cancer) calculated for ultrasound in these study settings was lower than that calculated for mammography: 13.2% for ultrasound and 18.4% for mammography. This is because mammography detected one additional malignancy in an asymptomatic area in a 32-year-old woman who was subsequently found to have a BRCA2 gene mutation. Mammography could do that because it scans the whole breast, whereas the investigators in this study used ultrasound just for scanning the suspicious lumps. A solution is offered in using the recently introduced ultrasound modalities, which are able to perform automatic full breast ultrasound scans , preferably enhanced by real-time tissue characterisation capability – a technology I’m working to develop. 1 Department of Radiology, University of Washington School of Medicine, Seattle WA. 2 Seattle Cancer Care Alliance, G2-600, 825 Eastlake Ave E, Seattle, WA 98109. Written by: Dror Nir, PhD. Thanks Dror. An insightful and informative piece. I appreciate your sharing this with me. 2) The paper includes information on detection rates according to BI-RADS assessment groups only. The mentioned sensitivity and specificity in my post are related to the whole cohort. 3) This study was conducted in women 30-39 years of age. The issue of dense breasts is not specifically addressed. Nevertheless, women at this age range usually are with mammography dense breasts. I think that women with all kind of breast tissue can benefit from screening by ultrasound. In regards to applying ultrasound to screening of patients with elevated risk for having breast cancer: Indeed, as I mentioned in my post, in this study ultrasound was applied to the suspicious lump only. Therefore, the conclusion was that it has limited benefit for such group. As said, I think that if ABUS was used, the conclusion might have been different. I hope I answered all your questions in a satisfactory manner. Otherwise, please do not hesitate comment again. If the negative predictive value is the same, a negative result in either case excludes CA. The sensitivity of 95.7% is the occurrence of a positive with the disease. The positive predictive value (not stated) is the presence of disease with a positive result, which must be somewhat less. A ROC curve would be helpful. In any case, the benefit of no exposure to radiation is something. So the US would be a good first choice. But we don’t know how it would stack up against the 3-D imaging, which limits exposure. You want the fewest false positives, and maximum negative predictive value. There was no ROC analysis done, therefore I could not mention that. In regards to comparing 3D Ultrasound with 3D MRI and 3D mammography – Tomographic imaging – I might post on that sometime soon. Thank you fou this very insightful post. Ultra sound focused oh the lump area, only. How was the lump detected, via self exam or by mammogram? Focusing on the lump area, is in sufficient, there are cases of several lamps, one bigger other smaller. At present ultrasound is accessible to patients only if a suspicious mammogram results are obtained via routine screening. In light of the fascinating results, you presented for the middle age cohort, how a 35 year old can arrive to the Women Imaging Cenert for routine screening and request ultrasound instead of mammogram? Routine screening is covered by the Insurance companies,annually and every 6 month for high risk cases. Penetration of the technology you are working on will require a change in the Guidelines for Routine Breast screening, a national procedure, the legislation of which is in the hands of congress in the US. Medical equipment obsolescence is another issue, to replace the entire intalled base of mammography equipment with new ultrasound machines for full breat screening would require capital investment on the part of many independent Radiology offices in the US. Decentralization of screening centers is characterized by high equipment obsolescence. If tomorrow an ultrasound full breat machine is approved by FDA, the access to the new technology will be immediate by screening centers currently serviced by GE Health and Phillips, HP – winning the market with the new technology requires, first, change in legislation og the screening protocol, second, having the leading companies mentined above licensing the new technology for mass production fo the new equipment, replacement of an existing installed base. Diffusion of innovations embedded in hardware has a life of its own. In mt first career on 25 years, I was the designer of economic-mathematical models for penetration of new models and upgrades for Amdahl’s highend mainframe computers which powered AT&T in mid 80s. Later on in mid 90s, as Head of Research for EDAC at MITRE, I was involved with the largest pricing model for addressing equipment obsolescence in the US Air Force. I would like to see ubiquitous penetration of the full breast screening ultrasound equipment and full accessibility to this service to follow universal healthcare insurance and a change in the National guideline on Breast screening. A patient who is coming to be screened for breast cancer as part of the routine (reimbursed) procedure in the USA cannot elect a different pathway. I guess that private paying patients will get what they are willing to pay for. what is your comment on the above? It is not only a matter of accuracy,but yes ultrasound is better as a screening method under 40 years old.The is another Question:serial mammograms before 40 Raise the risk of Breast Cancer!But after no! Well, it all depends how long you live..:) and for how many years you are screened. Normally, after 70 people do not screen any more. Anyway, the rule is: The more you are exposed to X-rays radiation the higher is the probability to get cancer. BTW; the elevated risk is for lungs cancer more than any other.